Richard Harrison stars in this well plotted pre-boom Spaghetti Western with Ennio Morricone's first genre soundtrack. RHV Italian R0 disc. Although the Spaghetti Western boom did not kick in until 1965, driven by the globally sucessful Sergio Leone films, European film-makers had been shooting Westerns as far back as the silent movie era. Duello nel Texas is a perfect example of these films that more closely resemble the genre's American cousins, rather than its later adaptations within Europe itself. In the small Mexican border town of Carterville, Lisa and Manuel Martinez are heading into town, her to pick up supplies, and him to get drunk. Before they go their father hands Manuel a bag of gold he has dug from their new strike, with instructions to cash it at the bank. That night Manuel gets very drunk and the next day finds himself home without the gold. Later that day three masked men raid the farm, stealing the gold and killing Manuel's father, he sets off in persuit but is shot in the shoulder. The events are seen by a man who turns out to be Ricardo (Richard Harrison), the adopted brother of the family, returning from fighting in Mexico. Devistated by the death of the man he called father, he sets out to track down the killers, but finds himself in conflict with the town sheriff who believes in law and order, and wants to see the killers brought to trial and not just killed in combat. From the beginning of the film, it is clear that this is not a traditional shoot 'em up Western - for the first 15 minutes were are introduced first to the daily routine of Lisa and Manuel and then to their estranged, adopted brother, building from the get go some strong 3-Dimensional characterisation that makes us really care about their fate later in the film. Unlike many of the later Spaghetti Westerns, where the lead characters were all but superheros, the characters here are very realistically portrayed and don't always hit their targets. The story itself contains a variety of twists and turns as Roberto tries to track down the killers, and most noticable is the very unstated way that plot twists are revealed through casual comments between the characters. Eventually it builds up to an exciting climax, with the titular duel a very tense affair. The almost unknown director Ricardo Blasco teams up with the cinematographer Massimo Dallamano who had gained experience shooting a variety of European adventure films during the 1960s and would later work with Sergio Leone on his Dollars films. 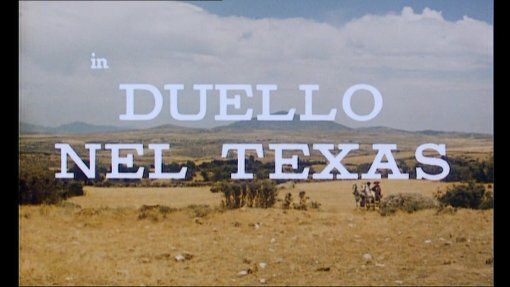 Duello Nel Texas is certainly very different to these most famous Italian Westerns and is generally well filmed throughout - most notable are the horse riding scenes which seem to have been shot from a poorly sprung moving truck and possibly by accdient have a handheld quality, making these scenes far more thrilling than usual, the fistfights are also well filmed, with some nice long takes. The 1.66:1 frame is very different to the scope widescreen frames used by Leone and subsequently most of the Spaghetti Westerns, but it suits this plot focused Western a lot better. The soundtrack by Ennio Morricone (credited as Dan Savio), marks his first genre score, with a catchy opening song. The American actor Richard Harrison had come to Europe as part of the sword and sandal boom of the early 1960s, and performs well in the lead role here. Italian born Giacomo Rossi-Stuart plays the sheriff, and is a familiar face from a variety of European films of the 1960s and 1970s - including The Last Man on Earth (1964) and Mario Bava's Knives of the Avenger (1966). Few of the familiar genre faces are here, but there are some solid performances all round. Most of the early European Westerns are poorly rated, simply trying to emulate the standard American formula - however, Duello nel Texas is a very impressive film, boasting a well written storyline, strong direction and a solid cast. Fans of the Spaghetti Westerns might well be disappointed by the lack of action and European style, but it should appeal to fans of the American Westerns and anyone who enjoys plenty of storyline with their Western. Recommended. Anyone famous in it? Richard Harrison - an American actor who made a name for himself in 1960s Euro-cult adventures. Directed by anyone interesting? Ricardo Blasco - an almost completely unknown Spanish born director with few other credits. Any gore/violence? A little blood. Recommended to Spaghetti and American Western fans. Good Soundtrack? The first genre soundtrack by Ennio Morricone with a catchy theme song. Visuals 1.66:1 Orginal Aspect Ratio. Anamorphically Enhanced. Colour. The picture quality is quite good - very grainy, but with good colours and minimal damage. Audio Italian and English original mono. Still photo and poster gallery as a video file with soundtrack backing. The disc box includes an insert containing a complete cast listing for the film. (in Italian). Availability Availabe in on its own, or in the Pistole Non Discutono boxset. Other regions? Available on a Japanese DVD with no English options, and in some public domain collections in the USA. Cuts? Believed to be fully uncut. Print used is Italian language. Well written and directed with a good cast, this film will probably appeal more to fans of the American Westerns and is recommended. A good looking and sounding DVD release, much better than the PD alternatives. See our reviews of more Spaghetti Western DVDs, and films with soundtracks by Ennio Morricone. Find the other films in the Pistole Non Discutono boxset. For explanations of technical terms, see the DVD Dictionary. All text in this review written by Timothy Young - 12th April 2007.